Online learning destination EdX today announced nine new master's degree programs, which offer a top-ranked, high-quality alternative to an on-campus degree at a fraction of the cost, according to the company. Three of the programs, in fact, are from top-10-ranked institutions and priced at under $10,000. Master of Science in Computer Science, University of Texas at Austin. In addition, edX has plans to launch additional master's degree offerings from the University of Edinburgh. 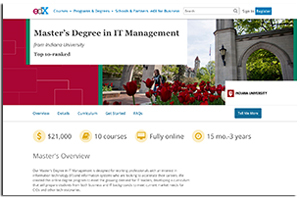 Many of the new degree programs have a corresponding MicroMasters program — a series of graduate-level courses and stackable credentials that can be applied toward a full master's degree (on-campus or online). Learners can take a MicroMasters course to get a taste of the online learning experience, engage with the graduate-level subject matter, strengthen a master's degree application or simply gain stand-alone skills for their own career advancement. "Digital technology is revolutionizing every aspect of our society and changing the nature of work. Existing industries are evolving while new fields are emerging, and there is a clear demand for the advanced knowledge needed to succeed in this new workplace. However, the investment of time and money required to gain this knowledge through a traditional on-campus master's degree is a challenge for many," commented edX CEO and MIT Professor Anant Agarwal, in a statement. "EdX is launching master's degrees that address both of these challenges. These stackable programs deliver the critical knowledge needed and demonstrate how we are pioneering graduate-level education at scale." For more information, visit the edX site.